Another year, another expected disappointment for New York Mets fans. With no Matt Harvey, a shaky bullpen, and holes at multiple positions, the Mets should be set for another 74-win season. Despite this, all hope is not lost for the future. The 2015 season is supposedly going to be the bright side for New York. If the payroll is going up next year, here are three players that can help launch the Mets back into the playoffs in 2015. Sergio Romo- Now everyone knows the Mets have had the best luck with signing closers. Billy Wagner was a bust and lets not even mention K-Rod. However, for the right price, Romo is definitely worth the risk. Coming off a 38 save season, Romo would be an incredible upgrade to this Mets bullpen. For a 4 year/ $40 million contract, Romo could be the answer to New Yorks bullpen troubles. Jed Lowrie- A class act player, Lowrie would be the perfect player to put next to David Wright in the infield. 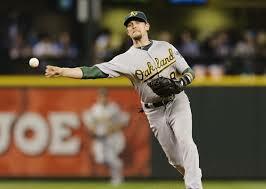 Coming off a career year and going into a contract year, Lowrie will likely command plenty of money in the offseason. As a contact hitter, with some pop, and a fantastic glove, Lowrie is worth every penny. Carlos Gonzalez- This is difference maker. Despite a back loaded contract, Gonzalez will only be in his early 30s when his contract is over. Not to mention he is well worth the money. A five tool player, Car-Go hit .302 with 26 homeruns, 70 runs batted in, and 21 stolen bases. With a lineup of Gonzalez, Wright, and Granderson, the Mets may be ready to return to dominance. What do you guys think? Will the Mets acquire any of these players? Is there someone you want the Mets to sign? Let us know in the comments! What do we make of the new home plate collision rule? With Spring Training games starting this afternoon in Florida and Arizona, we have a couple of new rules coming in to play that we should be aware of. One being manager’s challenges, similar to that of the NFL coaches’ challenge, and a new rule regarding collisions at home plate between a catcher and baserunner. The rule is as follows: If a baserunner goes out of his way to cause a collision with the catcher, the batter is called out, regardless of if the catcher maintained possession of the ball. Also, a catcher may only block the plate if he has the ball in his hands. At first glance, it seemed like the league, led by Joe Torre’s recommendations, was trying to ban collisions at home plate altogether from the game. But looking at this rule from a logical perspective, it makes sense. 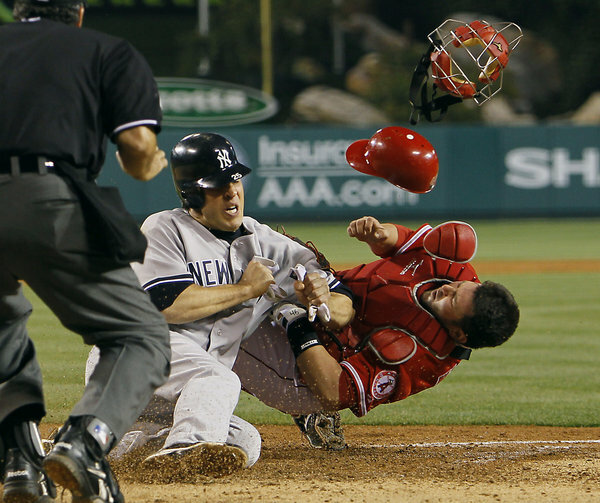 Collisions at home plate are part of some of the most exciting plays in baseball. The moment of suspense while the umpire is making his mind up whether the runner is safe or out leaves us in a state of suspense that seems like it lasts forever. But the idea behind this rule is not getting rid of all collisions, but the ones that don’t need to happen. If a runner is going for the plate, and the catcher has the ball and is blocking the plate, the runner has to try and knock the ball out. That’s fine. But if the baserunner is hitting the catcher just to hit the catcher, or the catcher is blocking the plate hoping the ball will get there soon, then we run into unnecessary violence. We have had nasty collisions in the past, and the one that comes freshest in my mind is that of Buster Posey’s collision that broke his leg and caused him to miss an entire season, and consider leaving the game of baseball. Whether that collision with Marlins’ Scott Cousins would be deemed “egregious” by the standards of this rule is a bit fuzzy or not, this rule change is meant to help promote player safety. By eliminating these unnecessary collisions, players can be safer around the plate. There always has been an unwritten rule, regarding these collisions, that if you know you’re out, to just give in and let it go. Also, by the catcher, they usually just wait for the ball to come in, because the other baserunners might advance if the ball gets by him. This rule just puts in guidelines of discipline and results of what an umpire might deem inappropriate. It makes sense to me. People might be looking too much into this new rule, but it’s simply a good move to help player safety. Tip of the cap for that. Reaction to Derek Jeter’s announcement. I always wondered what life would be like when my favorite childhood players would all retire. My parents and grandparents and all other older family members tell stories about players from their childhood, who made a big impact on them, and served as role models for them. They ranged from Reggie Jackson to Mickey Mantle, from Wayne Gretzky to Bobby Orr, no matter the sport. One of those players I get to tell my kids about is Derek Jeter. I remember my first Yankees game growing up, July 18, 1999, at the old Stadium. I remember the date, because the game was historic, with not a single Montreal Expos batter reaching base, with David Cone throwing a perfect game. But among the names I knew leaving the ballpark, was Derek Jeter. He was all my friends and I ever talked about during the 1998-2000 three-peat. Everyone wanted to be like Jeter, making those jump-throws and hitting the ball all over the field. He became the household name for a success story since day one in pinstripes. Growing up surrounded by other Yankees fans my age, we all loved Jeter. Over the years, I’ve attended many other Yankees games, at both the old and new Stadium. Jeter had played in most of them, and some times he delivered his usual clutch single or home run every now and again to spark the team. I watched his heroics on TV nearly all the time. I remember where I was when he dove into the stands against the Red Sox, and I remember where I was when he deposited hit number 3,000 in the left field bleachers. Jeter is the last one left of the Core Four, a group of players including Jeter, Mariano Rivera, Andy Pettitte, and Jorge Posada, who were the backbone of the Yankees from 1996-2010, teammates for 15 years (save Pettitte’s 3 seasons in Houston). I grew up watching those 4 guys and knowing they’d be there to save the day. I never gave thought to reality that they were human too, and they wouldn’t play forever. I never thought I’d see the day where they won’t be there to bring the Yankees a win. When Jeter announced that he’s ending his illustrious career after this season, or whatever he makes of it at least, it hit me, that it’s an end of an era. An era with a standard of excellence that’s just ludicrously high. An era where the expectation is World Series or bust every year. Every year the Yankees didn’t make a title run, it was a disappointment. No one can live through those standards for nearly 20 years, especially in New York, where it’s always “what have you done for me lately”? No one, except for Jeter. There have been other players who have contributed to this dynasty of excellence, too many to list here. Every one of those guys had their moments in the spotlight. Yet, with many of those guys, if they start to falter, the Yankees faithful wouldn’t think twice about turning on them. Think about Alex Rodriguez. After his trade to the Yankees, he had MVP caliber seasons, and helped them win a World Series in 2009. But every other year, he was viewed as a goat, because he didn’t come through when they needed him to, or got into trouble off the field, and subsequently booed mercilessly. Jeter was one of the few that could do no wrong in New York. No matter what he did, the fans just shrugged it off and said, “It’s ok, he’ll get the next one.” It takes a special player for that to happen. Guys like that come once in a lifetime. He says he wants to settle down and live a normal life after his first-ballot Hall of Fame career is wrapped up. He’s always been quiet and to himself on a personal level. He doesn’t want to bask in the glory of being one of the best ever for one of the most iconic names in sports. He’ll get his day, when the Yankees unveil his #2 monument in Monument Park. He’ll get standing ovations wherever he goes, and it might turn into a bit of a farewell tour, much like Mariano Rivera’s last year. But that’s not the Jeter way. Yankees fans, like myself, are going down memory lane recently, thinking about everything he’s done for us and the city of New York. It’s hard to sum everything up. But when he’s gone, and the Yankees have someone other than Jeter at shortstop regularly, we’ll be missing him like hell. I’m still kind of curious what it’s like to recant tales of my favorite athletes growing up. At least I know I’ll be able to tell over stories about a legend of the Yankees, of the game of baseball, and the entire sports universe. Thank you Derek Jeter, for everything you’ve done, and everything still to come. Who will break out in the 2014 season? Baseball season is right around the corner, and with baseball comes fantasy baseball. People often look for those under the radar sleeper picks to break out and have a great season, then subsequently claiming you knew it all along. Well, we’re gonna look at the top 5 breakout players from each league, and keep them in mind for your fantasy drafts and pools, and we shall keep the bragging rights to ourselves. Jackie Bradley, Outfield, Boston Red Sox – The defending champs have been rather quiet this off-season, because they have a great team put together. Anchoring the outfield this season will be the 23 year old Bradley, who appeared in just 37 games last season, dealing with injury and switching between the majors and AAA Pawtucket. He’s got some competition for the starting job, but I wouldn’t expect Grady Sizemore to earn the job over Bradley. Despite Bradley’s struggles last season adjusting to the game, he’s got tremendous upside, and should flourish at Fenway this season. Danny Salazar, Starting Pitcher, Cleveland Indians – Baseball fans got their first real good look at Salazar during the AL Wild Card game against the Rays. We saw both the good, where he breezed through the first 2 innings, topping 100 mph on his fastball occasionally, and the bad, where he couldn’t get out of the 4th inning. This year, he will get a permanent spot in the Tribe’s rotation, where he can continue to progress, and show his potential. He can only impact games he pitches, but expect him to make a lot of hitters look silly. Nick Castellanos, Third Base, Detroit Tigers – The Tigers started last season with the corners of the infield manned by the one-two punch of Miguel Cabrera and Prince Fielder. With the trade of Fielder to Texas, Cabrera moved over to first, and Castellanos is getting his first shot at an MLB starting position. He was a late September call-up, playing in just 11 games, but showed promise in that and his time in AAA, hitting .276 with 18 HR and 76 RBI. He’s just 21 years old, and has a great offensive team around him to help him grow as a Major Leaguer. Kole Calhoun, Outfield, Los Angeles Angels of Anaheim – With the Angels moving Peter Bourjos to St. Louis, it freed up a spot in the outfield for Calhoun, who has been up and coming for the Halos for quite some time. The 26 year old played in 55 games last season, hitting .282, and an OPS of .808. He isn’t confirmed 100% starter just yet, but it’s expected that they will give the vast majority of starts in left to Kole, who we can probably expect a very solid year, surrounded by offensive power-houses in the Angels lineup. Jurickson Profar, Second Base, Texas Rangers – The former number 1 prospect in all of baseball had a tough rookie season, hitting just .234 in the 85 games he played, but this will be his first full season at his natural position, with Ian Kinsler being sent off to Detroit. He has tremendous upside, and showed versatility, playing in 4 different positions over the season. Texas has a very potent offense, and we can fully expect Profar to be a big part of it at the top of the order. Junior Lake, Outfielder, Chicago Cubs – Among the first players from the Cubs’ stacked farm system, Lake showed promise from center, playing in 64 games, and hitting .284 with 6 home runs. He probably won’t kill teams on his own, but he’s going to be a good threat near the top of the order on the North Side. In combination with the other young guns for the Cubbies like Starlin Castro and Anthony Rizzo, he will be a very good piece for the Cubs for years to come. Billy Hamilton, Outfielder, Cincinnati Reds – If you haven’t seen YouTube videos on this guy yet, then get watching them, and then keep this guy on high priority in fantasy drafts. He stole 75 bases in AAA last year, and has stolen over 100 in previous seasons in the Reds’ system. He was handed the starting job with the departure of Shin-Soo Choo, and will have a chance to put his much talked about speed on full display. Provided he can get on base, and that hasn’t been a problem for him, he will be a huge pest on the basepaths for years to come. Scooter Gennett, Second Base, Milwaukee Brewers – This 23 year old came in midway through the season, and put on a great show, hitting .324 and garnering an OPS of .834 in 69 games. He did so well, he stole the starting job from mainstay Rickie Weeks, and is now part of one of the top up and coming double play combos with fellow youngster Jean Segura. He will be an essential part of the lineup, getting on base consistently and keeping the carousel moving in front of power threats such as Ryan Braun. Expect good things for Scooter this season. Zack Wheeler, Starting Pitcher, New York Mets – The talk of the town in New York (when not complaining about the Yankees) was Matt Harvey, until he went down with Tommy John surgery. Among the other pitchers on the rise for the Mets is Wheeler, who was acquired from the Giants for Carlos Beltran, and he showed potential in his 17 starts in the majors this past season. Manager Terry Collins says he expects 200 innings out of Wheeler, and if he pitches to his potential, he will be a great #2 to Harvey’s #1 for years to come in Flushing. Anthony Rendon, Second Base, Washington Nationals – This sophomore had a solid first run in the majors, appearing in 98 games, hitting .265 and an OPS of .725. This year, he has the starting spot for himself, and will continue to improve on last year’s campaign this season. With a tremendous young squad around him, he should be counted on to hit near .300 this season, and be an essential part to the Nats’ continued rise in baseball. Get used to hearing his name in conjunction with Bryce Harper as the young guns in DC. Winner: Robinson Cano – Obviously the most sought after free agent this season, he demanded a historically large deal, 10 years and upwards of $200M, and got one. At age 31, his old team, the Yankees, were very hesitant to give him the long term deal that he desired. The gap was wide and nearly impossible to bridge, with the Yankees wary of the $189M luxury tax threshold. That’s when the Mariners jumped in and gave him the numbers he wanted. Most, if not all experts agree that the deal won’t be worth it over the term of 10 years, with his value doomed to diminish with age and a more pitcher-friendly home ballpark. 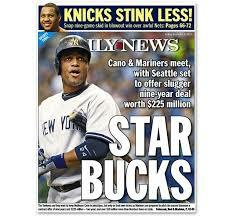 But Cano got what he wanted, and won’t have to work another day in his life after he’s done raking in this dough. Loser: Seattle Mariners – They locked up $240M over 10 years to Cano, which makes sense, considering he’s the top player in a premium position of second base. However, they bolstered their lineup around Cano, with Corey Hart, who’s missed the last season with an injury, and Logan Morrison, who has yet to hit his potential with the Marlins, which is saying something. With all the money they spent, they could have used it on more depth, as opposed to just spending most of their budget on one player. They are supposedly in on Nelson Cruz, which would probably get them out of the loser category, but as of now, they spent a lot of money on a little bit of improvement. Loser: New York Yankees – Due to their spending spree, the Yankees once again eclipsed the $189M luxury tax threshold, something they were looking to avoid. Looking away from that, they spent lots of money on older players. The youngest players in the starting lineup, McCann, Ellsbury, and Brett Gardiner, are all 30 years old. Despite addressing big issues, such as Robinson Cano’s departure, they still have many issues to deal with. Their infield is full of question marks, whether you look at Mark Teixeira and Derek Jeter returning from playing combined 32 games, Brian Roberts (missed 456 games the last 4 seasons) taking over for Robinson Cano’s departure, and the gap at third vacated by a platoon last year. The back end of the rotation includes a couple of players who haven’t started regularly in years, like Michael Pineda and David Phelps. Their bullpen includes David Robertson and a bunch of no-names. They have many issues that they didn’t quite cover. Winner: Arizona Diamondbacks – Despite having a quieter off-season, the D-Backs made a couple of key trades, to improve their team subtly. The three-team deal between them, the White Sox, and the Angels landed them Mark Trumbo, a fearsome power hitter to protect MVP runner-up Paul Goldschmidt. They also got closer Addison Reed from the White Sox. Just yesterday, they signed innings-eater Bronson Arroyo for 2 years. None of these 3 are marquee names, but all of them are key pieces in improving this team. No one said you had to make large splashes in order to take a step ahead. Loser: Cincinnati Reds – Another team with a quieter off-season, but they needed to make moves in order to gain back ground on the Cardinals and Pirates. They lost key players Shin-Soo Choo (Texas), Ryan Hannigan (Tampa Bay), and Bronson Arroyo (Arizona), and made too much noise not trading Brandon Phillips. To compensate for that loss, the Reds signed…well…not really anyone worth mentioning. They are calling up speed-demon Billy Hamilton to replace Choo in center-field. They are also considering putting flame-thrower Aroldis Chapman in the rotation. All of this will add up to the Reds missing the playoffs, and taking a step back in the NL Central. Winner: Texas Rangers – The first big splash of the winter came in Texas, when Prince Fielder jumped into a swimming pool was traded for Ian Kinsler. The big guy will man first for the Rangers, while second base will be covered by top prospect of years past Jurickson Profar. Also coming to the Lone-Star State is Shin-Soo Choo, who will hit near the top of the order, and get on base for the big Texas bats to hit him home. Along with a few other smaller signings, the Rangers improved mightily and will put up a good fight against the A’s for the AL West. Loser: Matt Kemp – With the emergence of Yasiel Puig in Tinseltown, the Dodgers’ outfield is now super-clogged with Puig, Andre Ethier, Carl Crawford, and Matt Kemp. With no DH spot to platoon to, and with multiple injuries hampering his performance significantly, Kemp is likely the choice to be left out. He’s owed $128M over the next 6 years, so his albatross contract is not one easily picked up by anyone with a budget. There have been rumors fluttering about, but nothing significant has arisen. As it stands, Kemp’s playing time would be diminished gradually until he proves his worth over the other 3 outfielders. Winner: The Fans – Baseball season is right around the corner. When you go outside after dusting the ol’ glove off and start throwing the ball around, you’ll see what I mean. This off-season included some massive shake-ups in the Majors so far, including big free agents, some trades, and injury news regarding those lost last season. But what prediction post is complete without some bold guesses? Here are some of mine. The Yankees will miss the playoffs: I’m well aware of all the money the Yankees spent this winter, with numbers estimating close to half a billion dollars in total contracts. But last I checked, money isn’t the immediate solution for problems this day and age. The Yankees spent a good chunk of money on a new-looked outfield, including Jacoby Ellsbury and Carlos Beltran, more money on a new catcher, Brian McCann, and a Japanese import pitcher Masahiro Tanaka, all while watching as Alex Rodriguez got suspended for the entirety of the season. All those are good things, but here come the not so good. The entire infield is full of question marks. Derek Jeter and Mark Teixeira are both coming off season-long injuries, with latest reports that Teixeira won’t even be at 100% this whole year. Patch-up replacements Kelly Johnson and Brian Roberts aren’t strangers to the DL either. Along with that, the back end of the rotation as well as the bullpen are not as reliable as the Yankees would like. Also, their farm system is nearly non-existent. Money can’t solve those problems to the tune of playoffs this time around. The Royals will contend for a wild card: For the first time in a while, the Kansas City Royals had a good season. 86-76 is a tremendous mark, for a team that’s been perpetually rebuilding since George Brett retired. But, now, they have one of the better up-and-coming cores of players including the likes of Alex Gordon, James Shields, and Eric Hosmer. The team had a fun vibe last year, celebrating with barbecue sauce and a light-up deer in the clubhouse. Their rotation took a hit, when Ervin Santana told them he won’t be returning, but still hasn’t found a new home, but that won’t deter them. They made a few smaller moves, picking up Nori Aoki, Jason Vargas, and Omar Infante, to go along with most of their club last year. Look for them to be that fun-loving team people can’t help but root for, because they are always underdogs. They may be a year or two away with the same group, but they are certainly on the rise. The Nationals will make a title run: I’ve been behind this notion for a couple of years, but this year seems like the window is wide open for them. The deepest rotation in baseball got deeper with the acquisition of Doug Fister from Detroit, to go along with phenom Stephen Strasburg, reliable Gio Gonzalez, and up-start Jordan Zimmermann. Young guns Bryce Harper and Anthony Rendon are another year older and experienced, and will begin to really tear up the NL East with their youth along side veterans like Ryan Zimmerman, Jayson Werth, and Adam LaRoche. The bullpen is also solid, with Rafael Soriano, Tyler Clippard, and Craig Stammen. There isn’t really a weak spot on this team, and they are among the most complete teams in baseball. Expect big things from DC this season. The Reds will miss the playoffs: This one’s tough, mainly because the group that they have has the look of a playoff team. But an off-season loaded with questions has me questioning their playoff possibility. The departure of Shin-Soo Choo is a big one, leaving a massive hole in centerfield, as well as in the lineup. The Reds are looking for help in speedster Billy Hamilton, but as a rookie, he will have his mistakes. Another question that will hover over this team is at second base, Brandon Phillips. The question isn’t how he’ll play, but how long he’ll play in Cincinnati. Questions rose all over the winter about whether he would be traded, with the Yankees seemingly as the top destination. If the Reds struggle, the calls to trade Phillips will get louder, which is bad news for the Reds, likely triggering an impulsive move. The team also is in limbo about what to do with Aroldis Chapman, the fire-throwing closer, whether to keep him or put him in the rotation. Last time a team had that question, they were following the Joba rules. If the Reds don’t keep pace with the Cardinals and Pirates, expect them to be on the outside looking in come September. The Mariners will miss the playoffs: Last year, I wouldn’t call this bold. This year, they decided to dust off their wallets and spend some money, bringing in Robinson Cano, Corey Hart, and Logan Morrison. Despite having a great 1-2 punch in the rotation, with Felix Hernandez and Hisashi Iwakuma, the rest of the rotation is filled with younger guys with little to no experience on a major league mound. Also, the lineup has exactly one name in it that would scare people, and that’s Cano. With a team that was just recently assembled, it’s hard to judge. Look at last year’s Blue Jays. They scored the big off-season move, trading for the Miami Marlins, and finished well behind the other 4 teams in the AL East. The Mariners are likely destined for a similar performance in the West, with the Rangers, A’s, and probably the Angels still ahead of them in terms of talent and veteran know-how. They showed some life by spending money, but they are still a year or two away from making noise again. 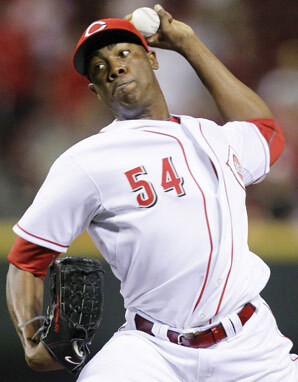 Should Aroldis Chapman stay in the bullpen, or venture into the rotation? Aroldis Chapman made his name by doing something better than any man in baseball history, and that would be throwing fastballs. I mean FASTballs. There were a couple of instances where the lanky lefty was clocked at 105 mph. You did not read that wrong. Since his entry into Major League Baseball with the Cincinnati Reds in 2010, he’s had 77 saves (38 each of the last 2 seasons), and struck out 324 hitters in just 198.2 innings. Doing the math, that’s alot. But there has been talk of changing his role with the team, and removing him from the bullpen, where he’s dominated hitters with mind-blowing velocity, and put him in the starting rotation. The thought process at first glance is simple. He’s good one inning at a time, let’s give him 5-7 innings every 5 days, and see if he can replicate those outstanding numbers. He was originally thought to be a starter when he signed with the Reds, and has been in the bullpen since. But it’s not that simple. Relief pitchers give 100% of their night’s effort into that one inning they pitch. That is what allows the late inning guys to pump their fastballs at the high 90’s, to maybe breaking triple digits. Starting pitchers, on the other hand, have to divide that 100% of energy into every inning they pitch, and conserve their arm to be able to pitch later into games. Joba Chamberlain, for example, came on the scene in 2008, and was dominating hitters with a 98 mph fastball, and a complimentary slider that just disappeared (much like Chapman’s skill set, but with less 100 mph-ness). The Yankees moved him to the rotation, and his velocity slipped to the low 90’s, and his effectiveness exponentially fell. Compare this to Chapman. Chapman likely will have to tone his fastball down from averaging 98 mph roughly, to possibly low-mid 90’s. That’s a huge difference. His mechanics, as explained by Sports Science’s John Brenkus, can’t possibly be repeated 100+ times a night. Tim Lincecum has similar mechanics, and his effectiveness died down over the last couple of years, as his body caught up to him. So too with Chapman, that motion is extremely taxing on the body. As simple as he makes it look, a human arm isn’t meant to throw a baseball 100+ mph. The tremendous strain it causes on his arm and shoulder would cause his arm to collapse if he tries overthrowing his fastball too many times. Also, part of the reason Chapman is so effective, is that at that velocity, his control doesn’t need to be pin-point. Batters have less time to see where the ball is going, and will wildly hack at it, trying to hit it. If Chapman’s fastball is more pedestrian, say at 94 mph on average, hitters have more of a chance to decide not to hit it, and can pick and choose rather than guess on the fastball. That would increase his walks, hits, and home runs, and decrease his strikeouts. While Chapman is in the bullpen, his quasi-legendary velocity is unleashed, reaching 100 mph on average. But if he’s installed in Cincinnati’s rotation, his effectiveness will hit a sharp decrease. The transition the opposite way has shown success, but it’s incredibly rare to find a reliever make his way to being a number one starter overnight. I’m sure he’d be effective, but I doubt it would work in the Reds’ benefit. Keeping him in the bullpen optimizes his talents, and allows him to use his full potential every outing.